Protesters who converged on Seattle for the meeting of the World Trade Organization did something really great, for the people of this country and peoples of the world. 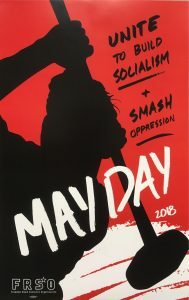 They shined a spotlight on the agenda of exploitation and oppression that is being advanced under the banner of “free trade.” There is no doubt that heat in the streets contributed to the collapse of this round of trade negotiations, which is a good thing for workers, farmers, and the environment. The rich and powerful had high hopes for the WTO meeting. At these gatherings, the most powerful countries get together behind close doors and impose their will on everyone else. In Seattle, these dreams disappeared into a cloud of tear gas. That a few forces in the streets put forward reactionary slogans, or used the opportunity to bash third world countries, in no way changes the positive character of the protests. Property damage and active resistance to police violence by some demonstrators has led some to the wrong notion that there were “good” and “bad” protesters in Seattle. This view is wrong. It was the collective efforts of the many, who had different concerns and different ideas about how to respond to the WTO that made Seattle actions so successful. Seattle was an inspiration to all of us who are working for justice. The actions showed once again, that corporate power can be successfully challenged. All that is required is people in motion, a clear analysis of the problem, and a will to win.